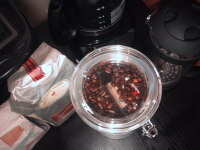 When a new post arrives, the coffee buzzes and lights up in one of four colors, so you can keep track of your favorite RSS feeds without sitting in front of the computer. 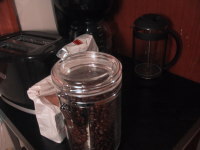 When ground and served, the coffee beans provide hours of caffeine-driven blogging. 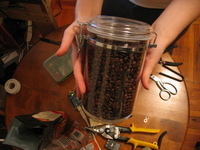 The toy can be easily refilled with your choice of coffee beans (and new batteries) when the supply runs out. Caffeine Alert, like Becky's Chatter IM pillow, uses the Plushie Message Framework (PMF) to connect Internet data with Arduino and signal wireless output. PMF can be extended for custom uses using a class-based PHP4 system. Current modules allow you to watch instant messages on Adium and to subscribe to a set of RSS feeds. The script runs as a background process that routes signals off to the receiving wireless toy, by way of the Arduino.